Google Play, formerly known as the Android Market, is the official app store for Android smartphones and tablets. When you get apps from the Store you ocan use them on your device. When you get music, movies, books and other digital content from the Store, other Google Play apps let you play, listen, watch, or read.. The Google Play Store has: Apps & games for Android devices and Chromebooks. Movies & TV shows which you can rent or buy. Music for purchase or streaming subscriptions. Digital books. News and publication subscriptions. First you need to visit Google Play Store to search for applications and games you want to download. Now copy link address of the application just like the google drive above. 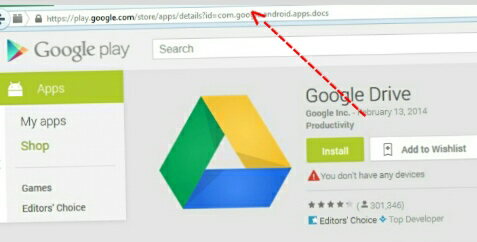 Then carefully paste the link on the site http://apps.evozi.com/apk-downloader. Click on Generate Download Link. Finally click the green download button to download your application..
Nice post bro we found this post helpful. In all my life, I wonder why I never thought this was possible. Quite well, I knew how to download Youtube videos but this, I was totally dumb to! You can go for google it lot of new information there when i always use in google help of Ingic my new project. Google play store really bring a vital change in the access and uses of modern application IT products. I am connected with the web designing company in Pakistan.